Family Focused: Eastside Exterminators is a local, family-owned company. Since 1969 we have protected thousands of homeowners and businesses just like you from structural pests. Eastside’s focus is on providing real solutions and value to you, our customers. We personally feel like you are family and want to have a life-long relationship with you. Passionate: We are passionate about what we do. We resolve pest issues, drain crawl spaces, and insulate the Puget Sound area because we love to help people and believe that people deserve to be treated fairly. We are even open on Saturdays to serve your needs since many aren’t available during the week. Committed: We are a Licensed and Bonded Company and PSE Certified Specialist. Each of our technicians acquires over 30 hours of training before ever going into the field. We then provide ongoing monthly training on pests, effective pest control solutions, insulation, use of thermal imaging systems, home energy audits, BPI audits and more. Our technicians are truly the best in the business and customize solutions to meet your unique needs. Eastside Exterminators is committed to serving you! Do the Right Thing: At Eastside Exterminators we always strive to do the right thing. You’ll get the very best pest, wildlife, and insulation service in the Greater Seattle area, from our service warranty to our specialized, highly trained technicians, to our innovative process. We believe in clear communication, straight forward service and transparency in what we do. If we make a mistake, we will fix it. Let us show you how good we are! Outstanding and comprehensive work by Bobby, as I have come to expect. Very thorough. Tim, the technician explained everything about the process to me in detail. The only thing I was surprised by was the cost. But I have a large home with a large crawl space. We really appreciate you coming to oir new house for an initial assessment. We feel confident on how to move forward and what we should to do prevent pests from entering our house! Very professional, knowledgeable, all around helpful with our situation. We thought Robert did a good job giving us the information we needed to make a decision. I do have a couple questions for him when the main work is over. Thank you, Will Peterson. Very professional, on time, Clean, respectful of our home! Very pleasant experience, knowledgeable and friendly staff. The crew was excellent! Two guys were onetime, pleasant to work with, did excellent work and went above and beyond for cleanup. I highly recommend them! Love the service and really happy with the insulation!! Eastside Exterminators cleaned up our crawlspace in 2006 due to a serious mouse infestation. They took care of our rodent problem as well as replacing all the insulation and vapor barrier. Its now 2019 and were selling our home. We had Eastside Exterminators out for a re-inspection. The crawlspace is still rodent free 13 years later! Thanks Tim and the rest of the Eastside Exterminators crew! Tim did a great job. Explained to us what he was doing, what he found, its implications, and remedies. Thanks. Robert did a fantastic job with the inspection. He was very professional and through, listened carefully to all my concerns and the estimate for upcoming work was less than I expected. I've been a customer with Eastside for a couple of years, for insect control. Unfortunately, I had a need to eliminate some rodents and Robert was a pleasure to work with. Thanks Eastside! I have been incredibly impressed with the professionalism, courtesy, timeliness and quality of the service from your company. You have made an uncomfortable situation painless to take care of. Great service! The glue actually caught 5 mice so far. Bobby was thorough and provided good explanation. Felt like he was very honest cause he could have sold me the works I was so creeped out but gave reasonable explanation for what was needed. Robert was nice, very knowledgeable and professional! Our experience so far was excellent! Extremely pleased with our recent inspection and services. Preventative exclusion work was done as well as attic vents for bathroom exhaust fans. The crew was professional and pleasant and I feel went above and beyond what was expected. Very good customer service! Great company and very friendly and professional staff. We are very pleased. Our Technician, Bobby, was most thorough in his inspection of our home. The team, Steve and Sean, that came out the next week were also very thorough and professional. 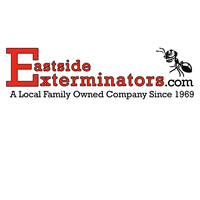 We will definitely recommend Eastside Exterminators to others! I had a very good experience with Eastside Exterminators. They diagnosed my problem quickly and did what was necessary to solve it. They were very efficient, knowledgeable and polite. They provide excellent service. Eastside Exterminators are great! Very professional. They take time to explain the problem and to recommend several different ways to take care of the problem. Their techs are very polite and nice. I highly, highly, highly recommend them! We are very happy with the service we've received so far. Our interaction with Bobby and Eddie have been professional, knowledgeable and courteous. Eastside Exterminators is top notch! Excellent service have used this company off and on for 7 years. Carrossino Holdings LLc. Everyone at Eastside Exterminators were so friendly! Tim, who was the one who did my initial inspection, explained everything in detail, as to our problems throughout the house and under the house, and what needed to be done. We had a bad rat infestation of our rental house. Tim made himself available for all of my questions and concerns, via cell, even on the weekend. The office personnel set up all of our work dates, and made reminder calls. The whole experience went smooth as butter. And best of all, no more rats! I highly recommend this company. Came up with a plan they are executing now for me that I feel will keep me from having any issues in the future. Very professional they know what their doing great people I recommend anybody to call them first. We've had Eastside Exterminators services on a couple houses and they have been outstanding. Very professional, kind and knowledgeable. Highly recommend them !! Fantastic customer service. Everyone we have worked with is professional and polite. Really happy with your services... the people were great! thanks Luke for being there and doing a GREAT job !!!!! Tim Matula. All EE employees have been prompt, professional & polite. I am extremely relieved that my home is secure from pests & confident it will stay that way with EE monitoring. Thank you Eastside Exterminators for your years of service to our family (way back to when I called you Townsend Pest Control). Always there when my Father needed you and for us now. Always on time, always professional and with fair pricing. Can't use enough adjectives to describe our faith in your company. Merry Christmas to the Townsend family. The inspection was thorough. Robert provided us with facts, proposed plan of action and a feeling of confidence that our situation would’ve resolved. The follow up wirk to correct venting issues was done with care and professionalism. The guy's preforming the work were great, Considerate and professional. The crew that removed insulation and did the spray foam in craw space were especially great at answering my questions.